Blatant plagiarism of the work of Eugène-André Oudiné. My personal experience in numismatics readily supports the third Vermeule quote in that it is my opinion that the Barber half dollar, quarter and dime designs introduced in 1892 survived the rigors of commerce in a manner that reiterated their artistry and ideas better than most other United States coinage. 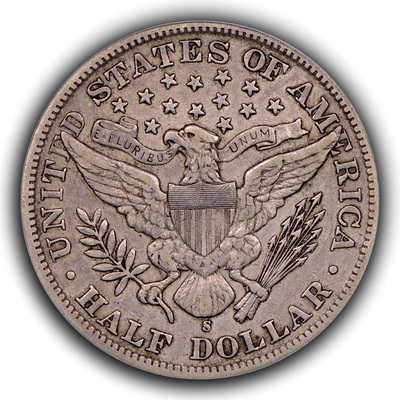 As such Barber coinage, and specifically the Barber half dollar, does not lend itself to a single, niche collecting range but rather can be studied, enjoyed and collected by concentrating on mint state and near-mint state examples, well-circulated pieces and those coins that saw many years of heavy usage. ​This article concentrates on well-circulated pieces (typically VF and EF coins) and is a new visitation of a previous topic that I wrote about for Coin Values magazine approximately a decade ago. This means that I will mostly disregard AU and MS coinage on one end of the spectrum while also spending very little time discussing AG through F coinage on the other end of the spectrum. The French proverb “plus ça change, plus c'est la même chose”  truly applies to collecting Barber half dollars in that no matter how much has changed in numismatics over the last decade, the underlying challenges and truths of the Barber half dollar series have remained constant. A 1907-S Barber half dollar in EF with original skin, darker color and retained dirt. Additionally, any article will contain the opinions and biases of its author(s) and this article is no exception. I strongly prefer coins that might be termed as having “original skin” and that retain marks, hits and nicks from circulation as well as any accumulated dirt, gunk and hue from commerce and storage. This becomes more important as coins wear into the mid-grades. These coins, which were struck more than a century ago, should look like they spent time in circulation and should have surfaces that do not look as though they were minted last year. 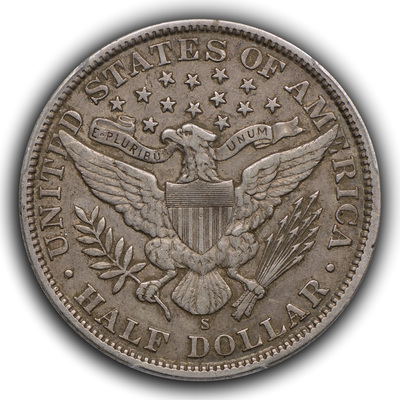 In general, as Barber half dollars progress down the grading scale, they will have darker areas gather around the periphery and along the edges of the devices on both obverse and reverse. These areas may make the open fields look less dark, though still shaded in various combinations of slate, navy and auburn. Luster is rarely evident once a coin wears to the VF30 grade and, if it is there, it should typically cling in the protected areas around raised devices such as the stars or date on the obverse and within the lettering or against the eagle’s body on the reverse. It should also be covered with a layer of patina that masks or attenuates it. Coins that have been stored for significant periods of time can take on an almost cameo appearance with very dark edges and lighter colored devices in shades of grey, rose or cinnamon. This prototypical look found on apparently unmolested mid-grade coins does not always extend to coins in other grade ranges. AU coins will typically be less muted in color, will have luster that is more obvious and that covers more of the surface, may cartwheel when rotated in the light and will many times look lighter in color than mid-grade coins. AG through F coins may often take on a two-tone appearance where the raised devices of the eagle and portrait look cameo upon a darker background. As the grade goes lower, the contrast in color between these two areas is quite often reduced or lost altogether as are all remaining traces of mint luster and the bits of dirt and gunk that might have stubbornly clung to the lettering, portrait or eagle. The loss of obvious debris should not be taken as definitive evidence of surface manipulation. Rather, as any coin wears to the extreme, the raised portions that had given safe harbor to dirt will be worn smooth and allow the retained dirt to escape. When these coins are abused and have had their skin removed by an inappropriate dipping or a harsher, mechanical cleaning, they might appear as a ghostly (some might write “ghastly”) mix of off-white and yellow or may turn the opposite way and be glossy, brassy dark blue-brown. Abused, lower grade coins are more likely to have a flat texture devoid of luster that might even appear polished. Usually, they will tone near the edges and this toning is often in the muted blue and yellow realm. Coins that have been intentionally darkened may look muddy blue and rose and will have fields that are too clean; that is, the fields will have no protective patina on them as it has been stripped off. Oftentimes, these altered coins will eventually become spotted due to improper rinsing or uneven accelerated toning. Quite a few of the lesser manipulated coins make their way into the holders of certification services. Experience has taught me that virtually every 1893-S or 1904-S Barber in F or VF will be either grossly overgraded, bent, corroded, scrubbed clean, holed and mounted or some combination of the above. They simply do not exist in meaningful numbers with original skin. The beauty of deterring what look one likes for Barber half dollars is that virtually any grade range can be completed with an adequate budget. While the caveat of “with an adequate budget” can leave one cold, this series can bring together collectors and dealers who inhabit every corner of United States numismatics. A well-matched, full-rimmed, dove grey VG8 set will be a challenge to build similar to a crusty, brown and grey EF set or a lustrous, original AU set. All can be achieved and all require patience and discipline. Those few collectors and dealers fortunate enough to put together an MS set will recognize the work required for these circulated sets. Barber half dollars offer the challenging goal of completing a long-term set spanning across three decades and two centuries of production from four different mints. 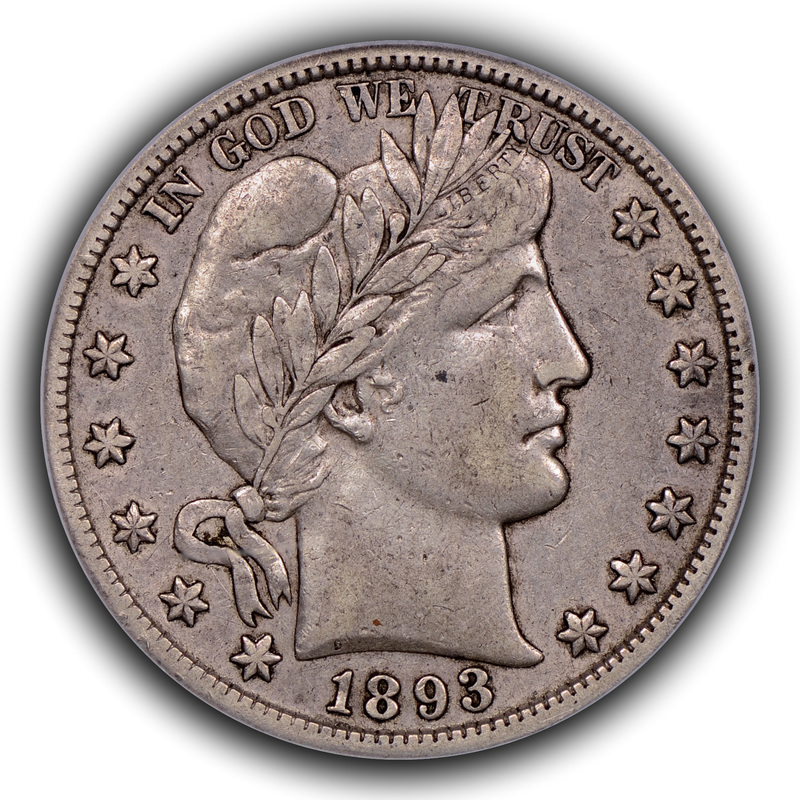 The half dollars are unlike the contemporary Barber dimes and quarters in that there is no coin comparable in rarity to the 1894-S Barber dime, nor any coin so highly valued as the 1901-S Barber quarter. They offer the wise buyer a tantalizing target and entertaining journey. ​The Barber half series is extraordinarily challenging in mid-grades, despite the traditionally laughable published prices for many of the coins, and this makes it truly a long-term project to complete in original skin VF-EF. There are no outright famous key dates such as the 1909-S VDB Lincoln, 1916-D Mercury or even the 1896-S, 1901-S and 1913-S troika of Barber quarters. However, there is a seemingly endless procession of horribly scarce issues. They pepper the series throughout its length and various mintmark combinations and at times even swap positions regarding scarcity depending upon grade range. The obvious candidates for most difficult coins include the O-and S-mints from 1892 and 1897, the 1893-S, 1901-S and 1904-S and the P-mint coins of 1913 through 1915. Difficult coins that are somewhat under the glare of those previously mentioned include the O-and S-mints from 1896 and the 1893-O, 1898-O and 1907-S. Much of the rest of the series is viewed as generic, which is mind-boggling. Deceptively tricky pieces include the 1894 and 1903, among others. Truly, there are only a few coins in the entire run that are ever available with little effort in this grade range; these include the 1906-D, 1908-D, 1910-S and 1915-D. Nearly everything is difficult with original skin and good eye appeal. An 1893-S Barber half dollar in EF. The King of the circulated series. This is an example that is slightly lighter in color with some cinnamon hues and liberal amounts of dirt clinging to the devices. 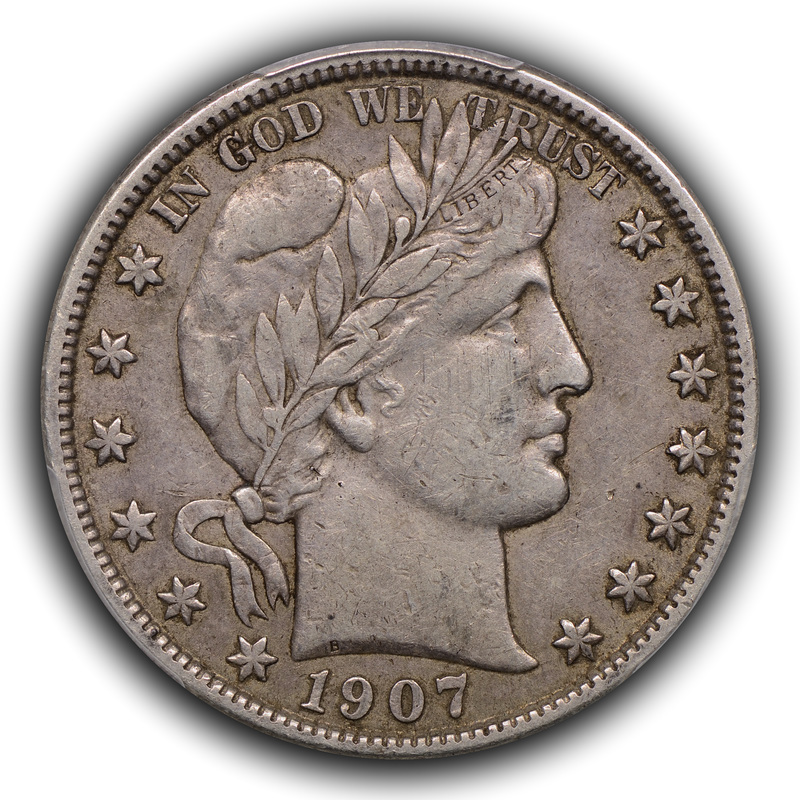 The 1913 through 1915 Philadelphia issues are desirable due to extremely limited mintages, which are among the lowest for regular issue coins in the twentieth century, but hardly difficult to obtain due to hoarding. Their status as well-known low mintage coins in combination with being the last of the series led to these coins being preferentially saved by the public and collectors alike. Today, they are some of the most easily found coins in certain grades. The 1901-S and 1904-S issues are not scarce in the lowest portions of the grade range as they are fairly available, and priced fairly low through VG8, after this point they become progressively more difficult to obtain with the 1904-S acclaimed as one of the two undisputed Kings of the mid-grade Barber halves. The other King is the 1893-S, which over the years has taken somewhat of a backseat to the hard charging 1904-S, but the difficulty of this coin in any grade above a full-rimmed VG10 and with good eye appeal and original surfaces should not be taken lightly. The O and S-mint coins from 1892 and the 1893-O had for many years been difficult to find in grades above VG8 and through EF40, however each becomes more available as the grade progresses above EF40. This is likely because they were the first issues for this series from these mints, and the coinage was saved more quickly from circulation and at a higher rate than most following years. The remaining coins listed from 1896-1898 are heavily skewed in their populations toward the lower grades. This appears to have been due to very hard usage of the coins during their time of issue, coupled with their small mintages and presence in the middle of the series, so that very few people were actively removing the coins from circulation while they were still in mid-grades. Also, the O-mint coins are fairly poorly struck, which results in mushy coins that can lack fine details. 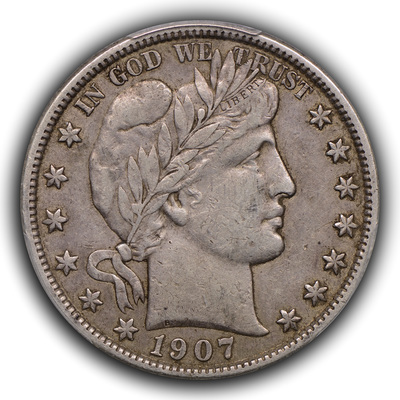 The best example of this is the 1898-O, which is viewed by many non-Barber collectors as a generic coin, yet is perhaps one of the handful of toughest coins to find from F12 through EF40. Another coin frequently encountered with strike deficiency is the 1907-O. Unlike today, half dollars were a workhorse of the economy when Barber coinage was issued. These coins saw continuous usage and were not saved from year-to-year in any great numbers. This is evidenced by the sheer volume of AG/G Barbers that are available at any show or on the web. David Feigenbaum had estimated that the average grade of extant Barbers is only about AG3 or slightly better. That is incredibly low and is even more amazing when one considers the numbers of low-grade coins that were likely melted in the 1970s and 1980s silver booms. Whatever grade range or look that one attempts to buy, one must also keep in mind that not all Barber half dollars will look the same. That is, there was significant strike variability within the series as well as other work performed that may make a coin from one date or mint appear different than a coin from another date or mint, even if they are of similar grade. The reverse of this series is not as well protected as the obverse; therefore, full-rim reverse coins with good eagle wing feather detail are not the norm. P, D and S-mint coins minted prior to 1909 generally had a fair amount of detail when struck, and this allows for some letters of LIBERTY to survive even down to the G4 grade. The letters of LIBERTY are set below the highest points of the coin and these will be evident, or partially evident, on low grade coins. LI and TY sit on the lower plane while BER is struck on the highest portion of the obverse and will quickly wear away, from the lower portion of the letters on up to the tops. Wear will also become evident near the nose and mouth of Ms. Liberty and work its way to the ear and neck as the coin is more heavily circulated. O-mint coins are typically more weakly struck, with the lower portion of BER not visible on coins that may otherwise have VF30 or better details. Issues including the 1898-O and 1907-O can be particularly devilish with respect to strike vs. wear and may look as though Ms. Liberty has more massive or fully formed neck muscles. In 1909 a new hub was introduced and this hub had a substantially stronger LIBERTY in the headband. The resulting detail allows lower grade 1909 coins to have a full LIBERTY even down to otherwise VG8 details. Collectors who rely on LIBERTY alone to determine if a coin is VF20 will make mistakes along the way until they realize that the coin in balance must be viewed to determine the grade. These mistakes may be costly in that collectors will overpay for overgraded coins that have a full LIBERTY and are graded VF20 yet have overall details consistent with F12, and they will be costly in that the opportunity to acquire otherwise choice VF30 coinage may be passed up on earlier pieces simply because BER is not complete. One will note the staggering fold increase in certified, lower grade Barber half dollars from 1997 into 2016. What was once a grade range with relatively few coins certified (92-coins for the entire series in 1997) is now an area that has seen a veritable flood of submissions (13,609-coins for the entire series in 2016). However, as the grades get higher, the fold increase in certification is reduced. I interpret this data to indicate that nicely preserved coins were always recognized as being rather scarce or unusual and that those coins were preferentially certified at an earlier time than lower graded coins. Additionally, those lower graded coins were not at one time worth the financial investment that certification requires, but now are financially viable for their owners. Lastly, the pool of certified Barber half dollars from VG8 through AU58 has increased from 1,458-coins in late 1997 to an whopping 23,269-coins in mid 2016! Special note should be made of those low mintage Philadelphia issues from 1913-1915 that were saved in large numbers. Those three issues in the VG grades have a combined population of 1,679-certified pieces. I adore the Barber half dollar series and think it offers myriad challenges to those dedicated enough to pursue their goals. Obviously, personal preference is just that; personal, but I would urge those who enter into this field to search for coins with original surfaces and good eye appeal. Accurate grading is the least of my concerns for these coins and I would suggest that it is better to acquire a perfectly preserved, over-graded coin than to acquire an average example that is accurately graded. This may be counterintuitive to the current climate that suggests that grading is everything, but I believe the underlying fabric of the coin and its surfaces beats all else. Marvin, W.T.R., “The New Silver Coins”, American Journal of Numismatics, 26 1892. Puck Magazine 47:1201, 1900, Keppler & Schwarzmann, New York, NY. I have an original magazine cover of this issue framed in my office. Vermeule, C., Numismatic Art in America; Aesthetics of the United States Coinage, 1971, The Belknap Press of Harvard University Press, Cambridge, MA, pp 86-106. Including references therein. Hooten, M. and Bush, T.S., “Seasoned circulation: The challenge of collecting circulated Barber half Dollars”, Coin Values, 3:10, 2005. Jean-Baptiste Alphonse Karr, Les Guêpes (“The Wasps”), 1849. Translated to English typically as “The more things change, the more they stay the same”. Lawrence, D., The Complete Guide to Barber Halves, 1991, DLRC Press, Virginia Beach, VA, p V.
 The PCGS Population Report October 1997, 1997, Professional Coin Grading Service, Newport Beach, CA. The PCGS Population Report, 2016, accessed online June 1, 2016.